When we think back to all the time we spent in pools as children, one of the things we remember is the itchy dry skin and sickly green hue of our hair from all the pool chemicals. Our parents always made us shower head to toe with special shampoo made to strip chlorine from your hair immediately after swimming. Here at Barron Swim School, we put a lot of research into finding the best water treatment system for our pool to combat these issues. Our pool has a state-of-the-art UV system with a chlorine base and multi-layer filtration. The hospital grade UV kills over 99% of harmful bacteria. A small amount of chlorine is added as needed to kill off the rest. The multi-layer filtration unit and our robot-vacuum clear out the rest of the dirt and grime. Our entire 54,000 gallon pool is completely filtered and treated every 90 minutes so your child and our staff are swimming in the clearest, cleanest water possible. Since our water is fresh, drinking quality water, you shouldn’t see any of the itchy skin, dry discolored hair, or red eyes that you get from a standard chlorine pool. Your child won’t smell of strong chemicals either. So, do you need a shower after swimming at Barron? That’s debatable, but we do provide two options to get your child cleaned off and out of here easily after class. The easiest option is to utilize our deck showers. Students are released from class directly to the deck shower area. These showers are instantly warm, and on a timer for water conservation. Just rinse off, or soap them down quick in their suit. The bonus is you just cleaned the swimsuit, too! For modesty, please remain clothed in our deck showers. Then you can towel dry and head to one of our many change rooms to get dressed and on with your day. If you need a more complete shower experience, Barron has two private showers in the family change room. 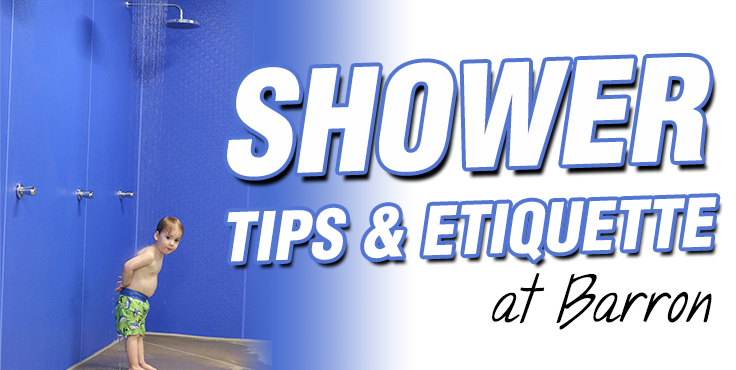 Since the private shower space is more limited, please be courteous to others and make it as quick as possible. We do not allow families to store items in the single showers during class to “reserve” them for after class. Other classes are released during your class and also need access to the showers. Please clean up after yourself when you are finished showering, and make sure you take all of your belongings with you.